What's the Difference Between a Policeman and a Militant? This isn't a cliched joke -- or at least it's not ONLY a cliched joke. I'm also actually curious. 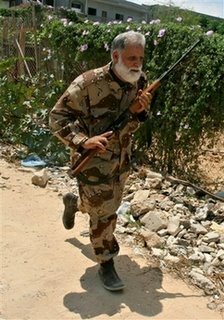 I see photos of Palestinian policemen and militants alike, all running around with rifles and camoflauge, looking to shoot at Israeli soldiers, and I wonder what the difference is. My first thought, obviously, is that if this guy keels over with a heart attack, we all know whose fault it's going to be. the caliber of their ammunition. militants call more press conferences. the policeman actually worries about his pension. one man's terrorist, er, militant, is another man's police officer. the policeman and the militant would both just as soon shoot you as write you a ticket, but for the policeman it's because he hates the paperwork. But those are just silly answers, and probably not even right -- even if there is a faint whiff of truthiness about them. Why bother with policemen at all, if they are just going to perform the same function as militants? After all, it's not like these warriors of law and order are out there stopping the militants from launching rockets into Israeli territory, or locating kidnapped Israelis being held in their jurisdiction -- if they were, there would be no need to skulk about hoping to shoot Israeli soldiers, since there wouldn't be any Israeli soldiers. But even if these policemen aren't stictly necessary, there are a few advantages to having them around. Policemen are very useful in diplomatic agreements. No, they don't sign the treaties, but they are the primary source of military hardware and organization that are actually allowed in treaties with Israel. And if the original numerical limits designed to prevent police forces from becoming an army have long since been breached, who's going to let the Israelis get away with complaining about that? If the Palestinian Authority can boast of the highest security to civilian ratio in the world -- one a staggering eight times higher than that of the United States -- that saves the militants the headache of having to organize their own reserve forces. Palestinian policemen also make great cannon fodder. Sure militants can get killed too, but when a militant gets blown up, there's always the risk a quality rocket launcher goes up with him. But when a representative of law and order and peace and everything good -- that is, a policeman -- is killed by Israeli forces, well, you just can't buy PR like that. When Israel kills a Palestinian policeman -- regardless of what he is planning to do to them -- it is a heartless act committed against the very forces of peace they were acknowledging and arming just months earlier. Of course, when you can get your militant and a police officer all rolled into one, that's the best answer of all. // posted by AbbaGav @ 7/06/2006 10:05:00 PM | | | Permalink | EmailThis!